The True Low air Loss Mattress System 42" width is packed with all of the features available on the market today. This medical air mattress is used in our hospital accounts. The Pro99-42 True Low Air Loss system offers an alternating pressure therapy option with continuous low air loss. This low air loss system is not only extremely comfortable but heals up to and including stage 4 bedsores and pressure ulcers. This low air mattress has 3 distinct therapy modes. The unique pulsation mode reduces the air flow every 30 seconds to 50% of the comfort setting. The pulsation cycles can be adjusted from 1 minute - 20 minute cycles. This feature adds enhanced comfort and healing benefits and will intermittently reduce pressure and increase blood flow. The alternating pressure mattress can be adjusted by cycle times for pain management and patient comfort. The caretaker or patient has the ability to change the cycle time from 5 mins, 10 mins, 15, or 20 mins. Cycle time adjustments allow increased blood flow to the infected area and can reduce painful pressure points for additional patient comfort. The user friendly adjustable pump allows you to increase the firmness and softness of the mattress within seconds. On Demand Low air Loss is designed to keep the patients skin cool and dry. The mattress is divided into 5 distinct pressure zones. The unique cell on cell design offers two layers of protection for the patient. The top cells offer exclusive multi zone pressure distribution based on the patients weight. The torso zone, which has the most weight reaches 100% of the set pressure. The thigh and leg zone reaches 75% of set pressure. The Head Zone which has the least weight reaches 50% of set pressure. The Heel Zone reaches 50% of set pressure for patient comfort. Bottom Lower Cells remain firm and static preventing the patient from bottoming out in the event of power failure. Seat inflation feature increases air flow to prevent the patient from bottoming out when seated. The top cover is low sheer, waterproof and prevents heat and friction to the patients skin. The top cover is easily removable and washable. Low pressure audible and visual alarms notify the patient or care taker in the event of a drop in air pressure. This true low air loss mattress is the best on the market today for healing, prevention and comfort. This is the mattress we recommend for patients that are looking for the same mattress they used when they were in the hospital. Optional Side Bolsters prevent the patient from falls. 42"WIDTH X80" - 84"LENGTH X 8"DEPTH (wider than standard) Easily converts from 80" Length to 84" extra long if necessary. 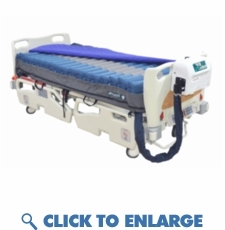 Fits on standard hospital bed frame or twin size mattress. The True Low air Loss Mattress System 42" width is packed with all of the features available on the market today. This medical air mattress is used in our hospital accounts. The Pro99-42 True Low Air Loss system offers an alternating pressure therapy option with continuous low air loss. This low air loss system is not only extremely comfortable but heals up to and including stage 4 bedsores and pressure ulcers. This low air mattress has 3 distinct therapy modes. The unique pulsation mode reduces the air flow every 30 seconds to 50% of the comfort setting. The pulsation cycles can be adjusted from 1 minute - 20 minute cycles. This feature adds enhanced comfort and healing benefits and will intermittently reduce pressure and increase blood flow. The alternating pressure mattress can be adjusted by cycle times for pain management and patient comfort. The caretaker or patient has the ability to change the cycle time from 5 mins, 10 mins, 15, or 20 mins. Cycle time adjustments allow increased blood flow to the infected area and can reduce painful pressure points for additional patient comfort. The user friendly adjustable pump allows you to increase the firmness and softness of the mattress within seconds. On Demand Low air Loss is designed to keep the patients skin cool and dry. The mattress is divided into 5 distinct pressure zones. The unique cell on cell design offers two layers of protection for the patient. The top cells offer exclusive multi zone pressure distribution based on the patients weight. The torso zone, which has the most weight reaches 100% of the set pressure. The thigh and leg zone reaches 75% of set pressure. The Head Zone which has the least weight reaches 50% of set pressure. The Heel Zone reaches 50% of set pressure for patient comfort. Bottom Lower Cells remain firm and static preventing the patient from bottoming out in the event of power failure. Seat inflation feature increases air flow to prevent the patient from bottoming out when seated. The top cover is low sheer, waterproof and prevents heat and friction to the patients skin. The top cover is easily removable and washable. Low pressure audible and visual alarms notify the patient or care taker in the event of a drop in air pressure. This true low air loss mattress is the best on the market today for healing, prevention and comfort. This is the mattress we recommend for patients that are looking for the same mattress they used when they were in the hospital. Optional Side Bolsters prevent the patient from falls. Easily converts from 80" Length to 84" extra long if necessary. Fits on standard hospital bed frame or twin size mattress. Plug and play auto-sensing control unit, operates in any country without changes. Has a high airflow blower, 45 � 5 CFM (1275 liters per minute). � State of the art micro-controller technology, monitors blower speed to set pressures. Software flexibility allows customer changes (custom pressures, times, and functions). � User-friendly control panel with dome keys and 7 segment LED display for simple user interface, displays current mode, A/P times, and patient comfort pressure level from Soft 1 to Firm10(8�4to32�6mmHg). � In upright (fowler) mode the pump inflates the mattress to 50% higher than the set pressure, to eliminate patient bottoming. � Max Flow mode with 15 minute timer for rapid inflation of the mattress, inflates in 15 ~ 50 seconds depending on the size of the mattress. � Provides effective true low air loss with or without alternating pressure. � Lock out key completely locks the control panel, to eliminate tampering of the patient settings, including power switch. � Audiovisual alarms in the event of power outage or low pressures (hose disconnect). Alarm silence key to mute alarm. Internal memory always retains current settings during power outage, will resume desired operation upon power return. Therapeutic support surface consists of superior quality, urethane coated nylon air cushions to provide effective alternating pressure therapy with true low air loss relief. Mattress has five different auto pressure zones. � OPTIONAL SIDE BOLSTERS constant air pressure side bolsters help contain the patient on the mattress. Air bolsters can be deflated for easy patient access into and out of the mattress, and also for easy patient procedures. � Low friction and low shear force producing, urethane coated breathable nylon top sheet, which is liquid proof and highly vapor permeable. � The air cells are connected to the manifold using quick connectors and fastened to the base. The top sheet is strapped to the base. � Single rugged, quick disconnect gang connector for rapid attach and CPR deflate functions. � Mattress has 80 holes in the air cells. � Complete support surface is made of superior quality materials and is modular in construction. All of the components such as manifold, tubing assembly, air cushions, top sheet, and foam base are interchangeable, and can be easily cleaned or detached for laundry. � Weight capacity: 1,000 lbs.